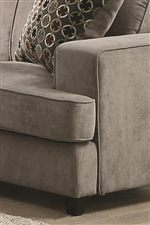 The Tess Sectional Sofa for Corners by Coaster at Value City Furniture in the New Jersey, NJ, Staten Island, Hoboken area. Product availability may vary. Contact us for the most current availability on this product. 500727B2 Sectional Sofa Box 2 1 0" 0" 0"
500727B3 Sectional Sofa Box 3 1 0" 0" 0"
500727B1 Sectional Sofa Box 1 1 0" 0" 0"
Pillow Three included accent pillows (measuring 21" x 21") create a finishing touch to the sectional sofa. Tailoring Welt cord trim provides a decorative tailored accent. Arm Thick track arms for a casual-contemporary style. Leg or Skirt Exposed wood legs in a small, casual style. Seat Support Sinuous spring base construction for comfort and durability. Padding & Ergonomics Webbed back construction increases strength and durability. Removable seat cushions make cleaning easy. Sleeper Mechanism Pull-out queen sized mattress for overnight guests. If you are seeking a sectional sofa that will offer your room comfort with a tidy look at an affordable price point, then look no further. 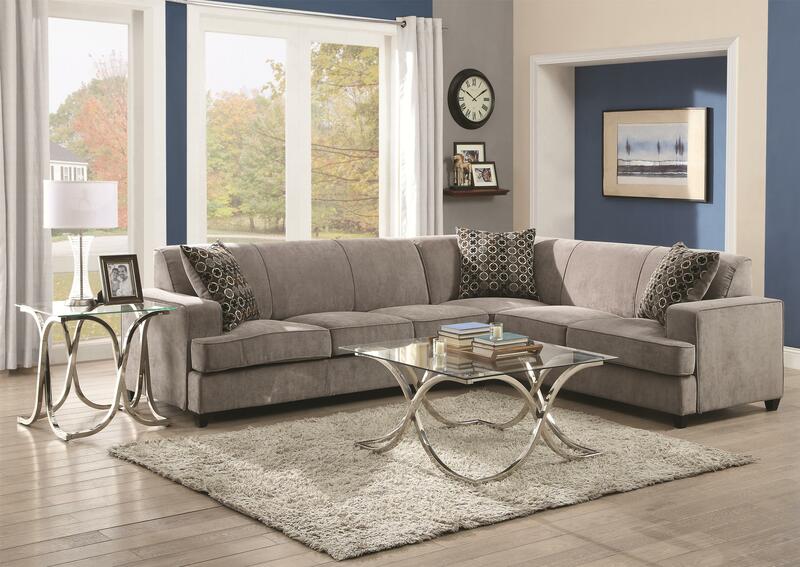 This neutral toned sectional sofa collection will give you just the design you've been looking for. The items in this collection feature straight lines that have a geometric influence and carry a casual, yet contemporary style. Accent pillows are included with the collection as an additional bonus to help brighten up your home and to add comfort. The Tess collection is a great option if you are looking for Casual furniture in the New Jersey, NJ, Staten Island, Hoboken area.